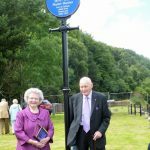 Date of Plaque unveiling – 25th July, 2015. 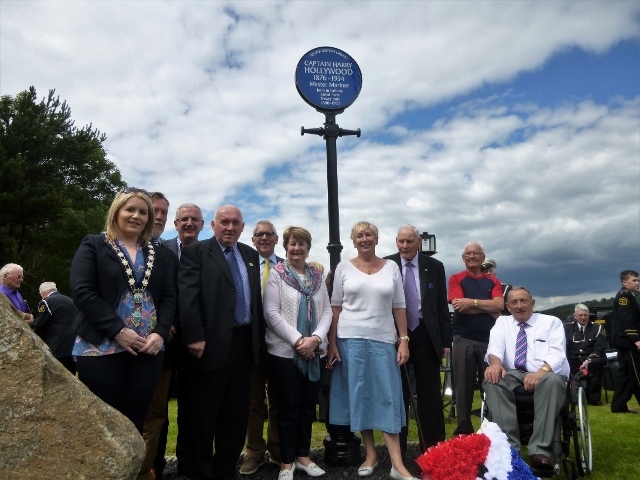 It was a ‘first’ on many fronts for the Ulster History Circle with the unveiling of a blue plaque to Captain Harry Hollywood. Never before had a plaque not been put up on a wall of a building; never before had a blue plaque been an intricate part of a bespoke Victorian lamp-post, and never before had a blue plaque been sited within a garden beside the Newry ship canal and within the area of the Victoria Locks, the oldest working locks in the British Isles. 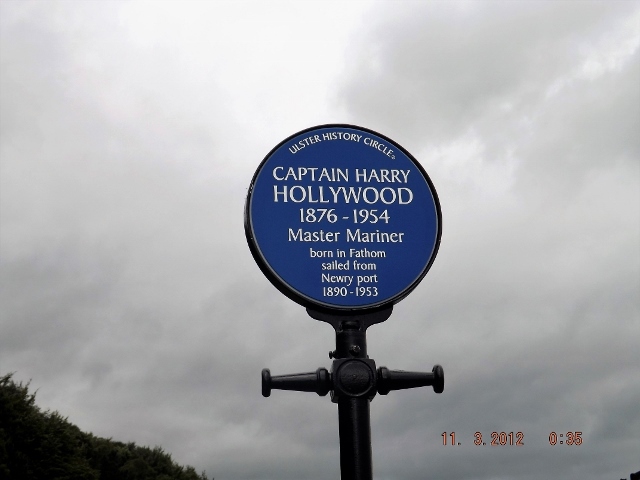 The man responsible for all these ‘firsts’ was the recipient of the blue plaque, Captain Harry Hollywood. MBE. In 1876 Harry Hollywood was born in Hawthorne Cottage at Fathom adjacent to the Victoria Locks. As a young man of fourteen he went to sea, and for the next sixty three years, sailed from the port of Newry to various parts of the world. During this time, ‘Wee Harry’ as he was known (he was only 5ft 3ins) saw the transition from sail to steam and to motor ship. He sailed with the Fisher Fleet of ships and was well known throughout the world. 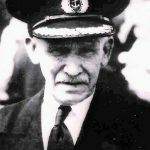 By the time he retired, he was Commodore of the Fisher Fleet – the Newry firm which operated the vessels. 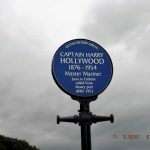 Captain Harry Hollywood was nominated for a blue plaque by the Newry Maritime Association, to represent all those ships’ captains who had for centuries sailed to and from the port of Newry, and formed part of its rich maritime history. 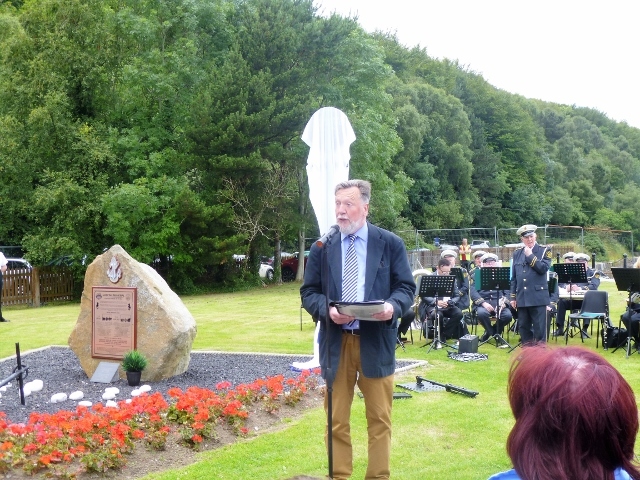 Within the maritime gardens, a large crowd of seated guests enjoyed the music of sea shanties played by the Camlough Brass and Reed Band, under its conductor, Tom McCabe. As Chris Spurr, Chairman of the Ulster History Circle opened the ceremony; he thanked the Newry Maritime Association for their sponsorship of the blue plaque, and the organisation of the event which included commissioning master blacksmith, Michael Mallon for the very special Victorian lamp post which incorporated the plaque. 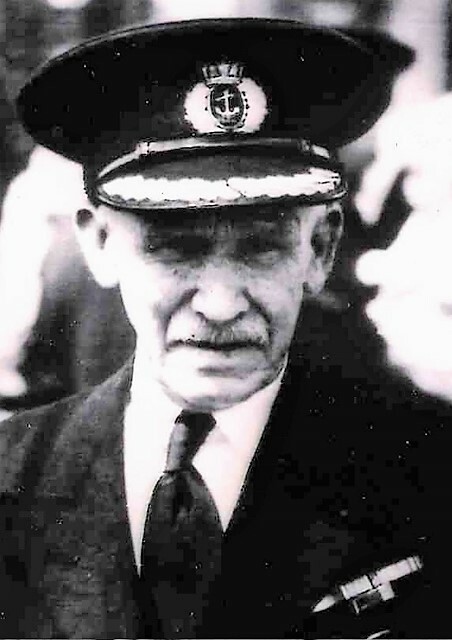 Chris Spurr said, ‘Captain Harry Hollywood spent a lifetime sailing from Newry and epitomised the dedicated seamen of the port’. 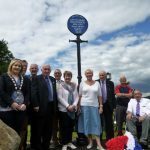 After speeches from Michael O’Hare, Chairman of the Newry Maritime Association, James McArevey, PR of the Association, and the chairperson of the Newry, Mourne and Down District Council, Councillor Naomi Bailie, the blue plaque was proudly unveiled by a friend and neighbour of Captain Hollywood and Fathom native, Eddie Quinn. 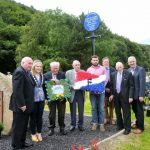 Floral tributes were laid in the maritime garden by Adam Fisher representing the Fisher Company, and by the Newry Maritime Association. After the unveiling, guests enjoyed refreshments at the Granvue Hotel, Omeath, Co. Louth, whilst listening to a talk on Captain Harry Hollywood by James McArevey . The commemoration to ‘the Captain’ came to a close with further music from the Camlough Brass and Reed Band. A very special day in Newry and Omeath. 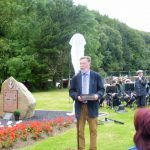 Chris Spurr, Chairman Ulster History Circle welcomes guests to the unveiling of the plaque at the Maritime Gardens, Victoria Locks, Newry. Eddie Quinn who unveiled the plaque and his wife Anne. 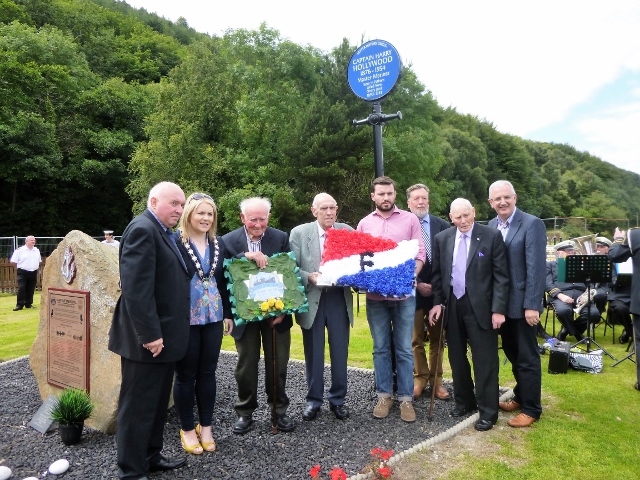 James McArevey, PR officer, Newry Maritime Association with Mayor of Newry, Councillor Niaomi Baillie, Eddie Quinn, members of the NMA, and Adam Fisher representing Fishers Shipping who laid floral tributes. Also in the picture Chris Spurr, Chairman UHC and Danny Kennedy MLA. far right, with members of the Ulster History Circle, Eddie Quinn and Mayor Niaomi Baillie. 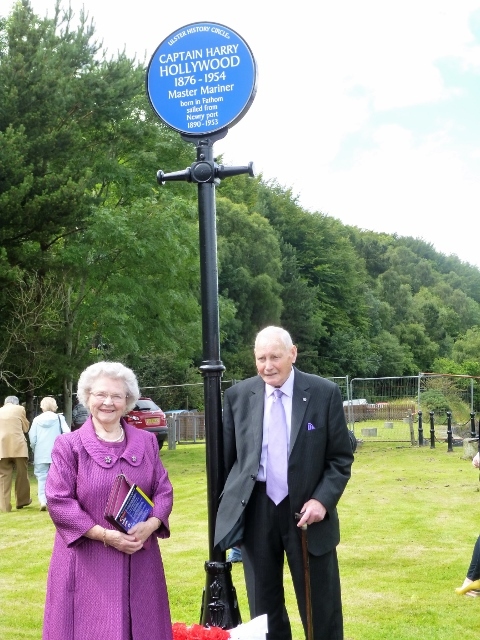 Victorian lamppost especially commissioned by the Newry Maritime Association from Master Blacksmith, Michael Mallon, to hold the blue plaque.